“Jimmy’s not just a cop’s cop. 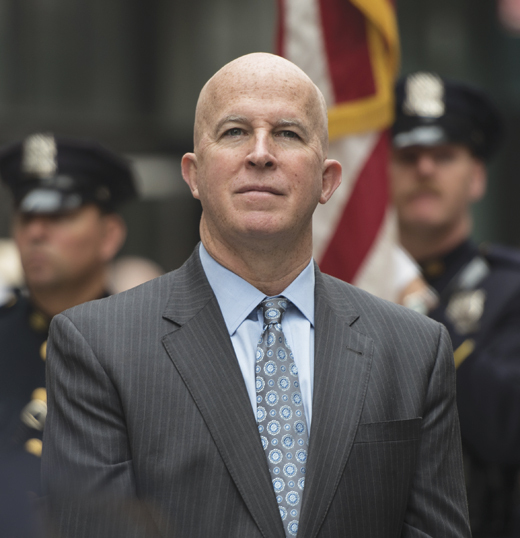 He’s a New Yorker’s New Yorker.” When it comes to James O’Neill, New York City’s 43rd and current police commissioner, those words by Chirlane McCray, the wife of N.Y.C. Mayor Bill de Blasio, could not be more spot-on. A more fitting NYPD commissioner couldn’t be found in Central Casting. He is a steadfast New Yorker who started his career guarding the treacherous 1980s subways and has since held almost every rank in the department. His first day as commissioner saw a bomb exploding in Manhattan. He likes hockey, motorcycles, and war biographies. He loves his mom, his sons, and Irish soda bread. 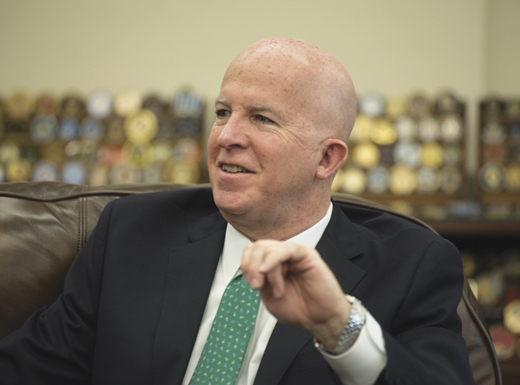 “I’m proud of my Irish heritage,” he says when he meets with the Irish America team at his office in One Police Plaza, “and I’m proud of being American, also. It’s all helped me be who I am.” He jokes that his sons, who are only half Irish, completely identify as being 100 percent. His sons, now grown, are Danny and Christopher. Danny is 29, works for an insurance company, and is engaged to be married. Christopher is 25 and works at the NYPD doing video production in the office of the Deputy Commissioner of Public Information. James O’Neill at the Hispanic Day Parade. 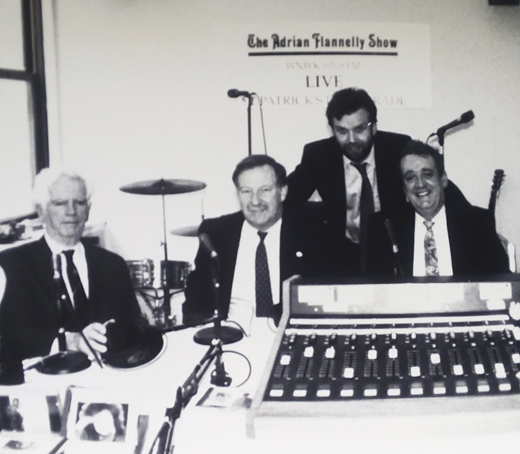 Their father, Joseph O’Neill, would work around the house on the weekends listening to the Clancy Brothers and other Irish music on Fordham radio station’s popular Irish program, Ceol na nGael. O’Neill’s maternal grandparents, Joe and Mary Kelly, came to the United States from County Longford. He spent a lot of time with his grandmother. Every Friday night, Helen O’Neill would put James and his brother on the bus at Beverly and Nostrand Avenue, and their grandmother would pick them up in her neighborhood, about 30 minutes away. His paternal grandparents came from County Monaghan. They lived on the same block as the O’Neills in Brooklyn. “My dad’s father didn’t show it quite as much,” O’Neill said, “but he was always looking after us.” He was a tall, stern man who worked for the telephone company. He came over to the United States after living up against the border in Monaghan through the Irish Civil War. “We were afraid of him,” he remembers. 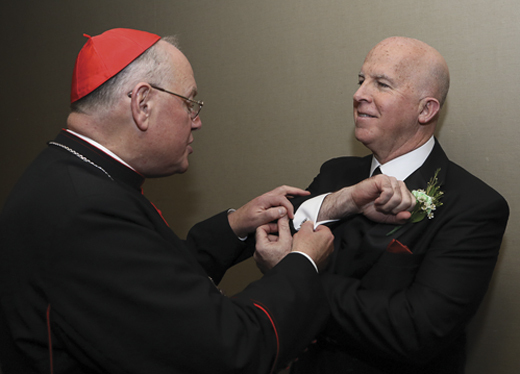 James O’Neill shows his cufflinks to Cardinal Dolan, the Archbishop of New York. O’Neill joined the Transit Police in January of 1983. He was 25 at the time and had been working at an insurance company as a surety bond underwriter. “It was a good job working with good people, but this was in my heart and if I didn’t do it, I would regret it later in life,” he said. He attended John Jay College of Criminal Justice, where he got a bachelor’s degree in government, and later a master’s degree in public administration. It was an act of bravery to even venture down into the place, and James O’Neill was patrolling the night shift. As a Transit Police officer for 12 years, he would ride the subway by himself back and forth from 168th Street and Broadway at the tip of Manhattan, down to J Street in Brooklyn, from eight at night until four in the morning. O’Neill is unique in that he rose through the department to eventually become commissioner. A chief of department, the most senior uniformed position, had not been promoted to commissioner in over four decades, according to Thomas Reppetto, the author of NYPD: A City and Its Police. He has held every rank in the NYPD except for detective (although he has been both a lieutenant and a chief in the detective bureau) and a two-star chief (because he jumped from one star to three stars). An impromptu press conference on a New York City sidewalk in 2015, when O’Neill was chief of department. O’Neill was commanding officer in East Harlem when the 9/11 attacks occurred. The police commissioner at the time, Bernard Kerik, had hosted a dinner the night before for all the commanding officers at the Museum of Natural History, so most of them were not in by eight o’clock in the morning. O’Neill got to his office in the 25th precinct shortly after the second tower fell. Every precinct sent a sergeant and eight officers down to the World Trade Center that morning. “Thank God nobody from our precinct died,” said O’Neill, “but we had a couple people who were seriously injured. We didn’t know where they were all day.” He somberly named four men whom he knew who passed away that day: John D’Allara, Mike Curtin, John Coughlin, and Joe Vigiano. There are three things the commissioner is looking at when it comes to antiterrorism: the NYPD’s ability to investigate, their ability to prevent, and their ability to respond. There is a Joint Terrorism Task Force comprised of 300 investigators from 56 agencies – 113 of them are New York City cops. Any threat that emerges from the stream is fully investigated, if not by the JTTF then by the NYPD’s Intelligence Bureau. There are also NYPD detectives assigned to 14 different locations around the world, embedded with either the local, state, or federal police wherever they are stationed, sending intel back to the department in real time. “We tabletop all the time, we run drills, and we make sure that we continue to talk to each other to ensure that nobody is keeping information to themselves,” he said. 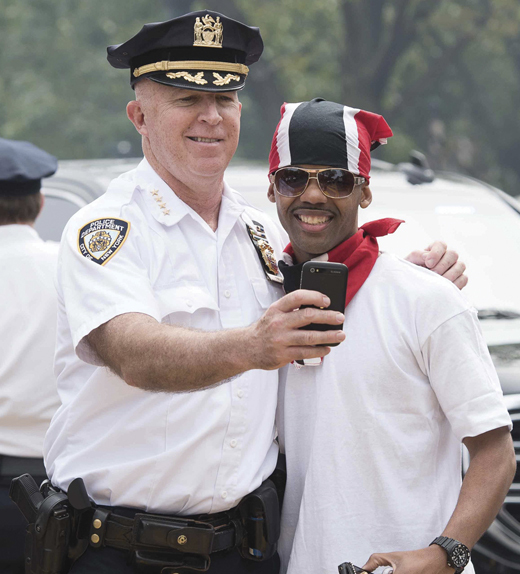 O’Neill takes a photo with a celebrant of the West Indian Day Parade. The bombing in the Chelsea neighborhood of Manhattan that injured 31 people occurred on September 17, 2016. O’Neill was legally, yet unofficially, sworn in as commissioner on September 16, the night before the attack, and officially sworn in at a ceremony the following Monday, September 19. They identified the suspect within 30 hours, and within 50 hours he was arrested. O’Neill found out in the middle of his swearing-in ceremony that they had caught the perpetrator. A lieutenant walked over and handed him a note with the news, which he then discreetly showed to the new chief of department also about to be sworn in, Carlos Gomez, whose eyebrows shot up. Unlike previous commissioners, who had spent time in the private sector among New York’s social elite and came into the commissioner job wearing custom suits with ties from Hermès or Charvet, O’Neill is more sartorially modest. “His shirts and ties are more Marshalls or Century 21 than Armani or Canali,” ribbed John Miller, the Deputy Commissioner of Intelligence and Counterterrorism. After growing up in that little community within the capital of the world, O’Neill understood that the key to effective, cohesive policing is personal relationships and mutual trust between police officers and residents. It is about having that neighborhood cop who is looking out for the members of the community. O’Neill talks to Irish America. O’Neill first developed Neighborhood Policing, a comprehensive crime-fighting strategy based on improved communication and collaboration with the community members, as chief of patrol starting in June 2014, and as chief of department, he expanded it. It is structured to provide sector officers with off-radio time to engage with neighborhood residents, identify local problems, and work toward solutions. Before Neighborhood Policing, the sectors were arbitrarily divided within the precincts. As part of Neighborhood Policing, the sectors have been redrawn to represent the natural neighborhoods. Much of Neighborhood Policing depends on being able to make decisions at the rank of police officer, which is something that did not typically happen before. Now, when something is going on in a sector, if the officers don’t take care of it, it will still be there when they come back in the morning, so they have to come up with a creative solution in conjunction with the community. The officers take pride in this new responsibility. “It’s all about taking ownership, working together, and creating some unity here,” says O’Neill. The final sector rollout was in October, making the strategy now operational in every residential neighborhood in the city. 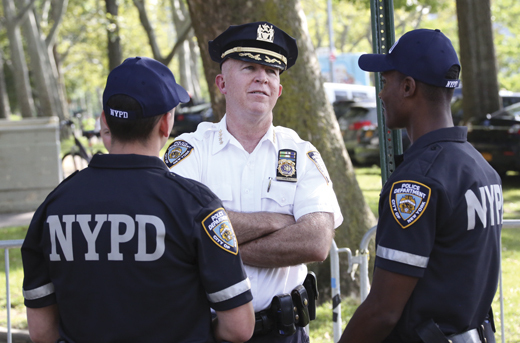 It is the largest, best funded, and best-staffed community policing initiative ever undertaken in the United States, and has fundamentally changed policing in New York City. O’Neill knew from his vast experience as a police officer that the idea had potential, but he did not know how successful it was going to be in action. As it turns out, pretty successful: 2017 saw fewer than 300 homicides, the lowest number since the 1950s, and 2018 followed suit. (For comparison, there were 2245 homicides in 1990.) This past October, for the first time in more than 25 years, New York City went an entire three-day weekend period without a single shooting incident. O’Neill attends a great deal of community meetings, so when he says, “Everywhere I go, I’m getting good feedback,” he means it. O’Neill talks to officers during National Night Out Against Crime. O’Neill says that the biggest challenge he faces right now is restoring the public’s trust in the NYPD. 2014 was a difficult time for law enforcement. Both of the grand jury decisions for the shooting of Michael Brown in Ferguson, Missouri, and the death-in-police-custody of Eric Garner in Staten Island, New York, came in November and December of 2014, respectively. 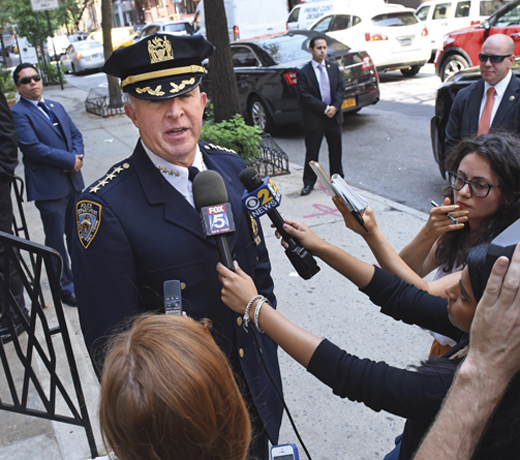 As a step toward building that trust in the NYPD, O’Neill announced in early February that he would support legislation to make more of the department’s disciplinary records public in the interest of transparency. “There are a lot of things we do well, but there are also a couple things we don’t do that well, and one of them is the transparency of our disciplinary system,” he said. O’Neill owns three motorcycles, a Kawasaki Concours, a BMW Adventure, and a sport bike. “The BMW has hard steel cases in the back, so it’s pretty cool,” he says. He and a group made up of mostly active or retired cops ride all around the country. They have taken trips to Tennessee, Montana, Arkansas, Kentucky, West Virginia, and many trips to Maine. Click below to see Commissioner O’Neill’s remarks upon being inducted into the Irish America Hall of Fame. 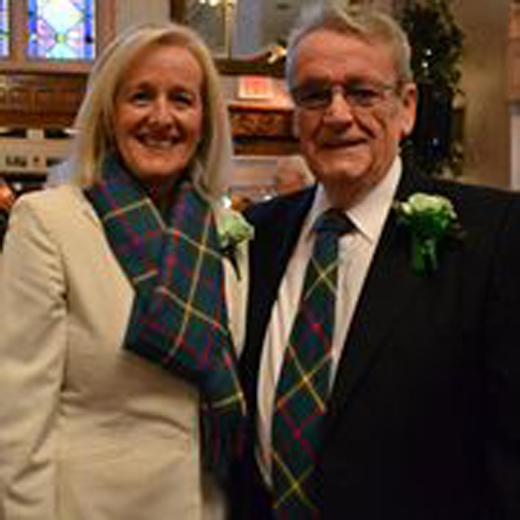 Dearie – a longtime New York state lawmaker and 2019 inductee into the Irish America Hall of Fame – is referring to a ribbon that was specially designed so that Irish-American groups could express their support for the appointment of a special envoy to Northern Ireland. Whatever differences of opinion all of these Irish groups may have had at the time – and there were surely plenty – they all wanted then-president Ronald Reagan to know that the U.S. should play a bigger role in efforts to bring an end to the Troubles in Northern Ireland. 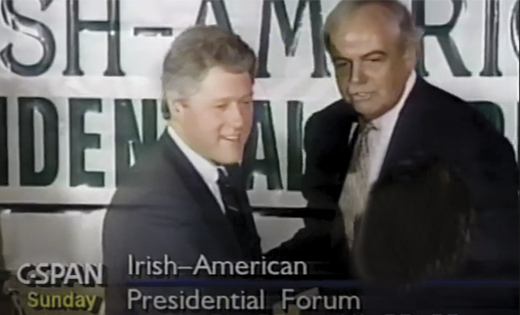 John C. Dearie introduces candidate William J. Clinton to one of the Irish-American Presidential Forum attendees. New York City, April 1992. At the time, this seemed a very ambitious – even unlikely – hope. The situation in the North was terrible, with hundreds dying in political violence every year. Meanwhile, the U.S., especially during the Ronald Reagan and Margaret Thatcher years – often cited its “special relationship” with Great Britain, when defending its hands-off approach to the North. And yet, within a decade, not only would a special envoy be named (the one-time U.S. Senator from Maine, George Mitchell), but the historic Good Friday Peace agreement would be signed. 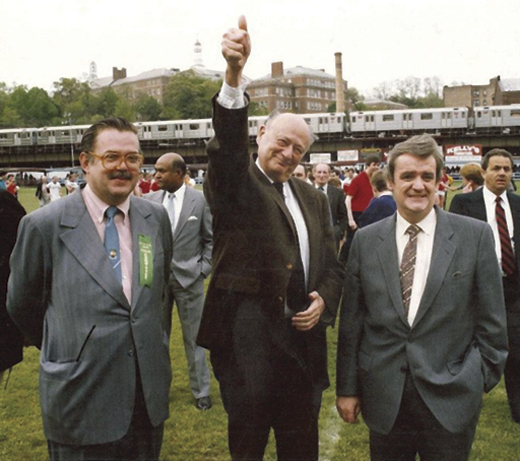 John Dearie – a Bronx native, with roots in Cork and Kerry – played a key role in making it all happen. Dearie was referring to President Bill Clinton, elected in 1992, after promising the Irish-American community that America would play a bigger role in the peace process. That included not only appointing Mitchell, but also agreeing to issue a visa to Sinn Féin leader Gerry Adams, so that he could travel to America and lobby for a prominent nationalist role in the negotiating process. Adams has been a mainstream figure for decades now, so it’s hard to remember when he was a pariah in the eyes of many British officials, and even some influential Irish Americans. But when Adams himself looked back on these events, he could not leave out the important role John Dearie played. “In April 1992, a well-known Irish American, John Dearie, organized a forum on Irish issues in Manhattan’s Sheraton Hotel for Democratic presidential hopefuls Jerry Brown and Bill Clinton,” Adams recalled in his book A Farther Shore: Ireland’s Long Road to Peace. Many credit these Irish-American presidential forums with putting Northern Ireland on the U.S. political agenda. And since, in Dearie’s opinion, it has dropped off the radar in recent years – despite the serious threat Brexit represents to the situation in the North – he says the 2020 election is the right time to bring such forums back. Albany introduces Dearie’s bill, the MacBride Principles, signed into law later that year by Gov. Mario Cuomo (first in the nation). Clockwise from left: Gov. Cuomo, John Dearie, Paul O’Dwyer, and Sean MacBride. 1986. 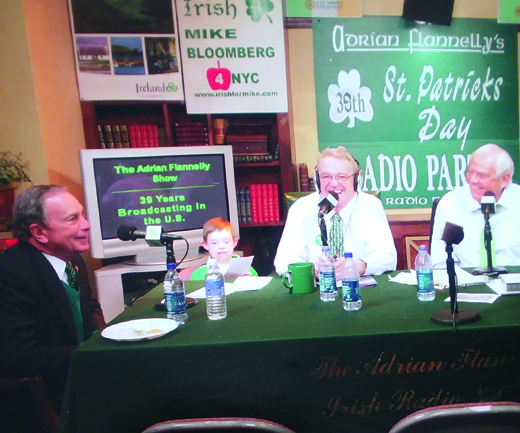 Dearie says he is particularly proud to be named into the Irish America Hall of Fame alongside the likes of Adrian Flannelly, with whom he discussed so many important Irish issues of the day on radio. Both of his parents have passed, but Dearie knows they would be particularly proud of this honor. 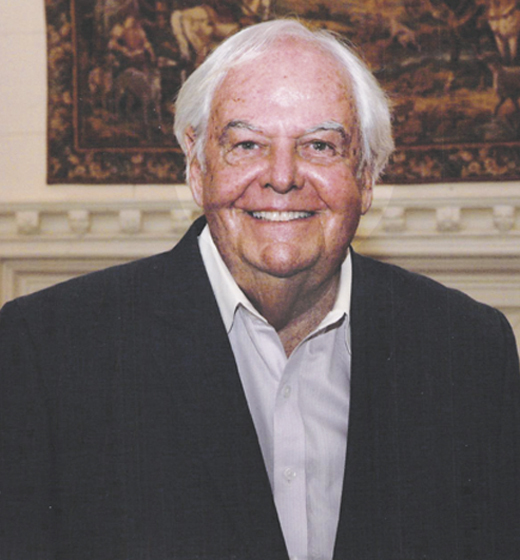 John Dearie’s road to international peace negotiator began on the streets of St. Raymond’s parish in the heavily Irish Parkchester section of the Bronx. His father was a union plumber, while his mother worked for an advertising company. John Dearie drives around Dave DeBusschere for a Notre Dame basket. January 10, 1960. (Detroit Free Press). Dearie attended what was then Manhattan Prep High School, run by the Irish Christian Brothers on the campus of Manhattan College. 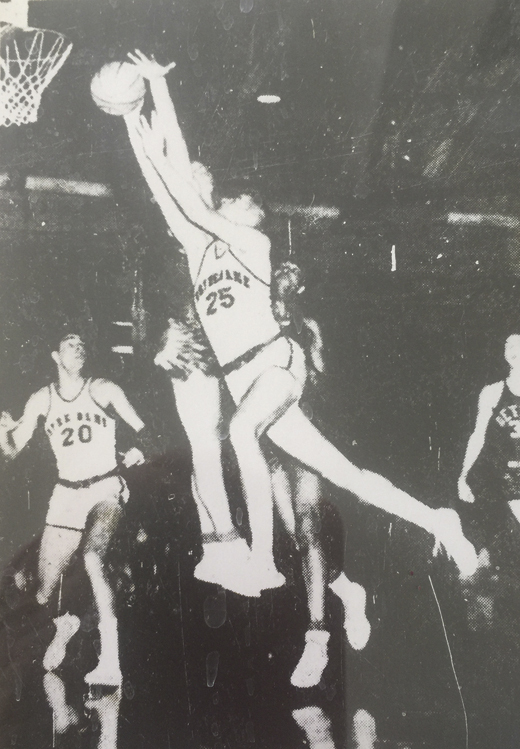 At a time when Irish Americans from urban Catholic schools were some of the top basketball players in the country, Dearie was an all-city player. He wound up with dozens of athletic scholarship offers – but one stood out more than others. Dearie played against a number of future NBA Hall of Famers in the late 1950s and early 1960s, averaging 10 points and eight rebounds a game. After Notre Dame, Dearie attended business and law school, also working at the United Nations, giving him his first real taste of the political process and the international scene. 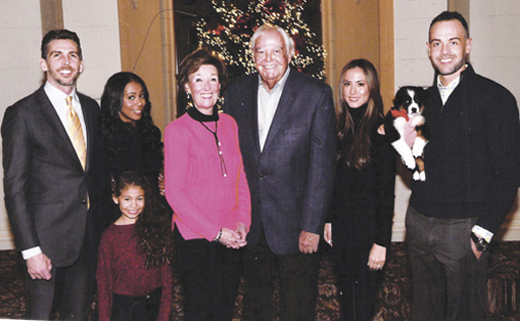 Kitty and John Dearie (center), with (from left) son Michael, his wife Clarissa, their daughter Isabella, Dearie’s daughter-in-law Liv with her husband, Dearie’s other son John Patrick. But when a New York State Assembly seat in Dearie’s old neighborhood opened up, he decided to enter politics. At the time, the burning issue of the day was U.S. involvement in Vietnam. Fellow Irish-American assemblyman Sean Walsh, who represented Fordham, turned Dearie onto issues related to the Irish on both sides of the Atlantic. 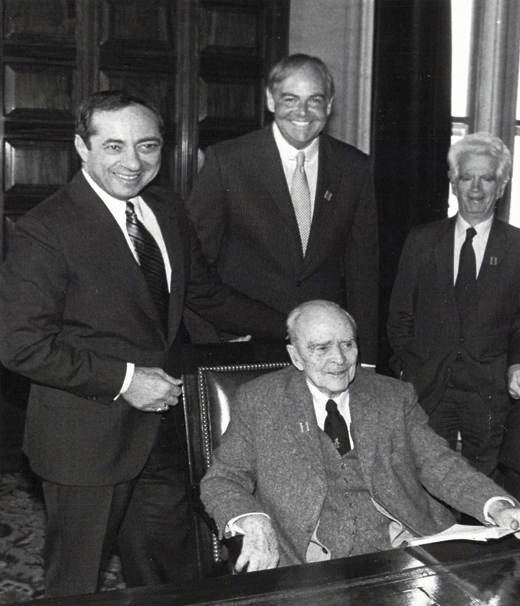 “In the ’70s and ’80s, there were a tremendous number of Democrats and Republicans, in the state senate and in the legislature, who were Irish-American,” Dearie recalls, recounting the numerous issues the American Irish Legislators Society took on. There was the controversy over Joe Doherty, an I.R.A. volunteer who escaped from a Northern Ireland prison and fought extradition for years in the U.S.
Then there was the implementation of the MacBride Principles, which ensured that U.S. companies doing business in Northern Ireland did so without contributing to discrimination. Dearie grew upset with powerful politicians nodding to the Irish-American community by merely wearing a green tie on St. Patrick’s Day. He believed it was up to Irish Americans to put pressure on elected officials to address issues that actually mattered. 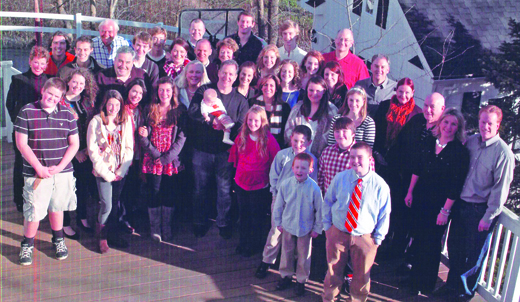 John Dearie pictured with his sister, Eileen (fourth from right), her seven children and their spouses, and 20 grandchildren. Now, after two decades of tenuous peace that Dearie helped bring about, fear is again palpable on the streets of Belfast. “It’s worrisome,” Dearie says bluntly. At the center of this controversy is the question of what kind of border Brexit may require between the Republic of Ireland and the North. “Not only (could Brexit) be economically destructive, if it results in the return of a strong international border, it could undermine the hard-won 1998 peace deal with Northern Ireland, known as the Good Friday Agreement,” the Times added. Dearie believes greater Irish-American involvement could help avert the worst-case Brexit scenario. Which is why Dearie says other veterans of Irish-American affairs, such as congressmen Richie Neal and Eliot Engel, as well as former congressman Joe Crowley, are looking to bring back Irish-American presidential forums for the 2020 election. More broadly, Dearie – who added that he is expecting to visit Ireland in April – believes it is important for a new generation of Irish Americans to reconnect with their culture. Click below to see John Dearie’s remarks upon being inducted into the Irish America Hall of Fame at the Pierre Hotel on March 14, 2019. Whether it’s the true-to-life tale of the late Gerry Conlon (the Belfast man who spent 15 years in an English prison having been wrongly accused) in In the Name of the Father, or the two bereaved mothers in Some Mother’s Son, or Hotel Rwanda (2004), about the struggle of Tutsi refugees against the Hutu militia, or, more recently, the tragic lovers fleeing the Armenian genocide in The Promise, the thread linking each of these films is unmistakable. No wonder, really. The 66-year-old Irish filmmaker learned about oppression the hard way, growing up in a city long divided by allegiance and history. “My father and mother came from the staunchly nationalist Markets area and the Short Strand in Belfast, and they aspired to get out of the ghetto, eventually moving to a lower middle-class Protestant neighborhood,” he tells Irish America. 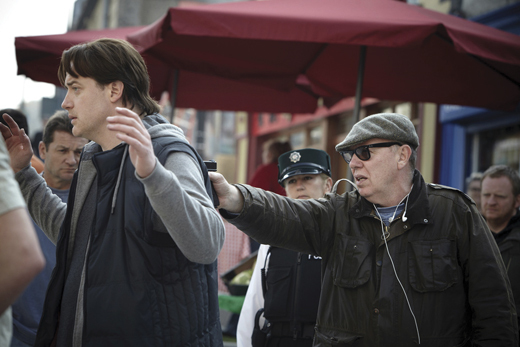 Terry directing Brendan Fraser in Whole Lotta Sole (2012). Not everyone may be aware of how massive that exodus was: up to 60,000 people were burned out of their homes in Belfast alone in what was then the biggest displacement of citizens in Europe since World War II. It completely re-segregated the map of Belfast. Like a lot of young people at the time, George was himself swept up in the conflagration. In 1971, he was arrested with a group of fellow teenagers in a security swoop. For three days he was interrogated and beaten, until he finally confessed that he was in the I.R.A. to make it stop. He was then imprisoned without trial for eight weeks, and word got around quickly. After he was named as an I.R.A. member (a charge he denies), his family were forced out of their home by angry Protestant extremists – who threatened to burn it down. In 1975, George was arrested again. He was reportedly driving with armed militants when British soldiers stopped and arrested them, although George insists that he did not have a weapon. Soon after, he was sentenced to six years in prison. “In 1975, I was sentenced to six years and I did three,” he says. He was sent to the Maze, which at the time also held Gerry Adams and Patsy O’Hara, the third of 10 men to die in the 1981 hunger strikes. 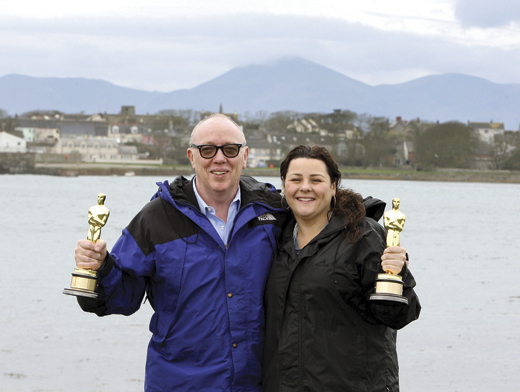 Ulster homecoming: Terry and his daughter Oorlagh pose with their joint Oscars for The Shore. The film won the 2012 Oscar for Best Live Action Short Film. Exodus was really the only option on the menu for that talented generation of Irish actors and filmmakers in the ’70s and ’80s in Belfast, he admits. Think of Kenneth Branagh, Liam Neeson and Terry himself – all of them had to leave their home to make their mark in their chosen industries. 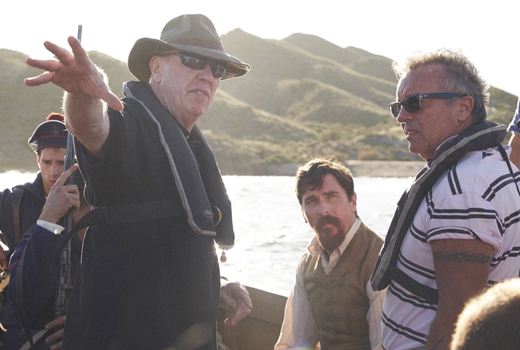 On the set of The Promise with the film’s star, Christian Bale (center). In 1985, George’s play The Tunnel, about his experiences in the Maze, opened at the Irish Arts Center, where Jim Sheridan was the artistic director. It caused a sensation and ran for six months. After that he wrote about the hunger strikers, an event that had enraged nationalist opinion across the spectrum in a way rarely seen. George says he did not agree with the tactic, but his exploration resulted in the screenplay Some Mother’s Son. The film focuses on the mothers of two of the strikers (played by Fionnula Flanagan and Helen Mirren) who are caught up their sons’ struggle. The script languished unproduced, but soon after Gabriel Byrne commissioned George to write In the Name of the Father, based on the true story of four people falsely convicted of the 1974 Guildford pub bombings, which killed four off-duty British soldiers and a civilian. The film received seven Oscar nominations. It’s success then allowed George and Sheridan to produce Some Mother’s Son (1996) in Ireland, with a budget of $8 million. 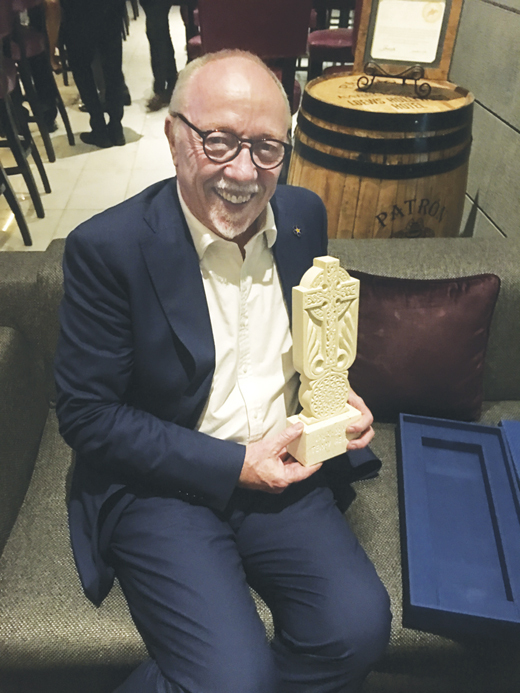 The Armenian National Committee of America named Terry Man of the Year in 2018. The cross (a typical Armenian cross) is the national symbol. Finding Gobi introduces us to ultramarathon runner Dion Leonard, who is joined on his 155-mile race by a devoted stray dog who accompanies him through the Gobi Desert, where the spirited little pup matches his steps over the Tian Shan Mountains and across the massive sand dunes of the Gobi Desert (giving him his name in the process) and keeping pace with Leonard for the entire 77 miles, eventually burrowing into his heart. 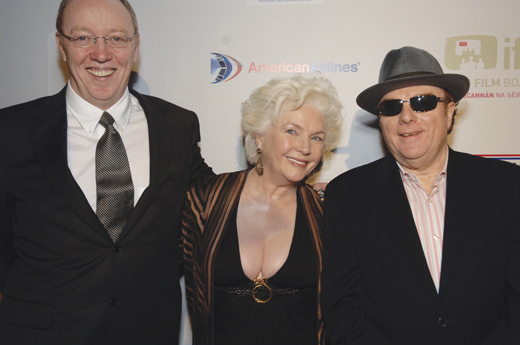 With Fionnula Flanagan, who starred in Some Mother’s Son, and Belfast’s legendary musician, Van Morrison, in 2007. While his work focuses on world conflicts, George’s heart is never far away from Northern Ireland. His film The Shore, about two boyhood friends who meet 25 years after they were torn apart by the Troubles, won the 2012 Oscar for Best Live Action Short Film. It was filmed entirely at George’s family cottage near Ardglass, County Down. The profound changes that have occurred north and south since he left have astonished him. Now is the time to reach out to unionism with persuasive arguments to make the case for reunification, he says. “They’re not being asked to join some Catholic priest-dominated state anymore. They’re being asked to join one of the most viable sections of the European Union.” It will be hard to get beyond the legacy of sectarianism and bitterness, “but if we can start down that road it will be to the benefit of all,” he says. Click below to see Terry George’s remarks at the 2019 Hall of Fame awards luncheon. The year is 1980. A former movie actor, Ronald Reagan, whose great-grandfather was an emigrant from the village of Ballyporeen in County Tipperary, is the newly-elected, 40th president of the United States. That same year another emigrant, Ciarán O’Reilly from County Cavan, was performing in an off-Broadway play called Summer by the Irish writer Hugh Leonard, where he met an actress, Charlotte Moore – granddaughter of expatriates from County Wexford – who was a fellow member of the cast. Thus begins the origin story of the Irish Repertory Theatre in New York, the most renowned theater company in the U.S., devoted exclusively to staging “the works of Irish and Irish-American classic and contemporary playwrights” (according to its mission statement) and providing a hearth and a home for audiences to savor the work of dramatists from Goldsmith, Synge, Wilde, and Yeats, to Beckett, Shaw, Friel, and Behan, as well as musicals with an Irish tilt: Finian’s Rainbow, Meet Me in St. Louis, and Take Me Along. The Moore-O’Reilly success could not have been predicted when, in 1988, the audacious notion of pivoting from acting to producing and directing plays popped to their minds. With the merest investment (actors earned only $100, no matter how long a play ran), they rented a small theater on West 18th St. in Manhattan and decided in cold blood that their first production would be Sean O’Casey’s The Plough and the Stars – a brave choice, because of its large cast and the intricacies of revolutionary politics in Ireland in the early 1920s. 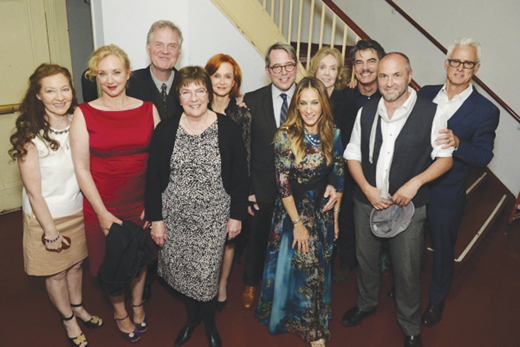 Terry Donnelly, J. Smith Cameron, Ciarán O’Reilly, Caitriona Yeats, Swoosie Kurtz, Matthew Broderick, Sarah Jessica Parker, Charlotte Moore, Peter Gallagher, Colum McCann, and John Slattery at the 2016 Irish Rep gala fundraiser. The production, directed by Charlotte, was a hit, so they put the proceeds into another play, and then another. Both forsook busy acting careers on and off-Broadway to become entrepreneurs. Among Charlotte’s many roles had been a part in Noel Coward’s Private Lives, with Elizabeth Taylor and Richard Burton. Ciarán made his Broadway debut in Emlyn Williams’ The Corn Is Green. Early in their new jobs, a woman telephoned Ciarán and declared that she greatly enjoyed their productions and might donate money to the new venture. She inquired if the company was non-profit. Ciarán innocently supposed that since there were no profits, the theater must surely fit that description. So it became officially a non-profit enterprise and has remained so, even as the Irish Repertory Theatre is now comfortably and happily in the black and one day soon will have paid off a debt of $6 million for the purchase of its permanent home on West 22nd St. in the Chelsea section of Manhattan. 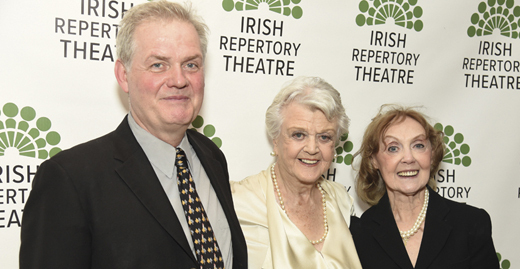 Ciarán O’Reilly, Angela Lansbury, and Charlotte Moore. The second big event is the Rep’s 30th anniversary, which is being celebrated in grand style from January through May, with the company’s most ambitious undertaking to date – a comprehensive retrospective of Sean O’Casey’s life and work, including the esteemed Dublin Trilogy: The Shadow of a Gunman, Juno and the Paycock, and The Plough and the Stars, presented in the order in which they were written. 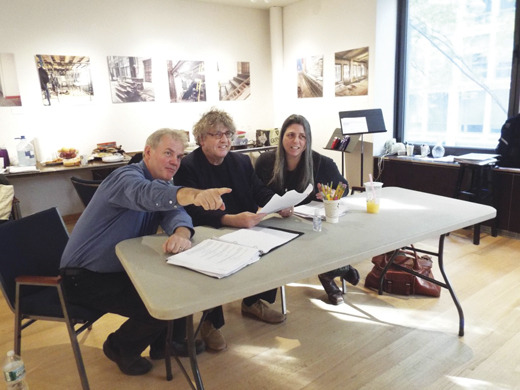 Each play is having its own run, followed by a month of all three works in repertory, including three “Dublin Saturdays,” in which the dramas will be staged all on the same day. Rep audiences are enjoying free readings of the other O’Casey plays, plus symposiums, lectures, film screenings, and a musical evening. Ciarán O’Reilly, in the act of directing The Dead with Paul Muldoon and novelist Jean Hanff Korelitz, who had the idea to do James Joyce’s short story as an immersive theater production. Shivaun’s father, born in 1880 in Dublin, was the youngest of 13 children in a Protestant working- class family. He was largely self-educated, worked at menial jobs, became a committed socialist, and early on discovered his yen to be a writer. Eventually, he wrote more than a score of plays, many of them controversial because of their irreverent take on aspects of political life in a troubled Ireland, plus a six-volume autobiography, essays, and short stories. His earliest submissions to the Abbey Theatre were rejected until The Shadow of a Gunman was accepted in 1923. He rests comfortably in the pantheon of the 20th century’s major literary figures. 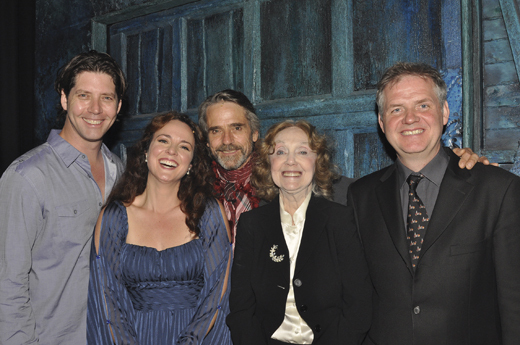 The Irish Rep Gala, June 4, 2018: James Barbour, Melissa Errico, Jeremy Irons, Charlotte Moore, and Ciarán O’Reilly. As a kid growing up in Southern Illinois, Charlotte already was performing in Catholic grade school plays, yearning to be an actor. “I wanted to be a movie star,” she recalls, with a smile, but shifted her focus to live theater, which soon became her passion. That led eventually to roles in many venues, including the New York Shakespeare Festival, and more awards than we can list: the Drama Desk Award, Outer Critics Circle Award, The Wall Street Journal’s Best Director Award (2011), plus two Tony nominations. Her adaptation of the musical Camelot was the attraction at this year’s Lincoln Center Theatre fundraiser. Longtime supporter and 2018 gala honoree Tina Santi Flaherty, with Jeremy Irons, who participated in the stage production of songs by lyricist Alan Jay Lerner. 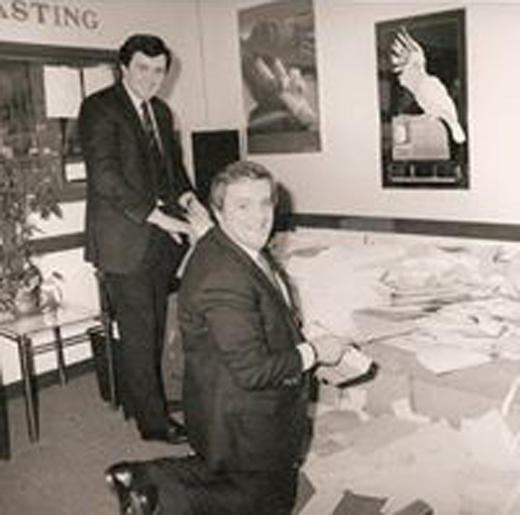 Ciarán O’Reilly suspects that his own involvement in theater derives from his father, Paddy O’Reilly, a politician who served 33 years in Dáil Éireann, the Irish parliament, from County Cavan. “Politics is a form of theater,” Ciarán feels sure. He, too, is hung ’round with awards for acting and directing. He has appeared at the Abbey in Dublin, on Broadway (A Touch of the Poet), worked in movies (e.g. The Devil’s Own, starring Harrison Ford) and TV series (Law and Order). At the Rep, he has acted in many productions, including Dancing at Lughnasa, The Shaughraun, Candida, Da, and A Whistle in the Dark. His most outrageous performance, however, was not on the stage but on a motorbike when, in his 20s, he made a solo trip around the world. Yes, solo; yes, around the world – through Europe, Egypt, Syria, Jordan, Turkey – over land and then steamship to Australia, across the U.S., and home to Ireland. (That’s a whole other story.) What possessed him to embark on so perilous a tour of the planet? He explains: “As the fellow who climbed Mount Everest said: ‘Because it’s there.’” He brings a bit of that same adventurous nature to his life as an actor, producer, and director. On any performance day, as you enter the Rep’s crowded, bijou lobby with its mini-refreshment stand and phone booth-sized box office, you’re likely to encounter Charlotte Moore – petite, graceful, gracious – chatting with arrivals as they come through the door from West 22nd Street. And over there, his back to the wall: Ciarán O’Reilly, wreathed in a smile that quickens to laughter, is enjoying the craic in a cluster of patrons and admirers. Then you walk the short hallway to the stage, with its evocative set, and you’re immediately in the gravity field of Ireland and can almost breathe the aroma of a turf fire and taste the black, foamy stout, and you know you’ll hear the English language spoken with a passion and beauty you’re unlikely to experience anywhere else. Welcome to the Irish Repertory Theatre. Note: In honor of its 30th anniversary season this year, the Irish Rep is going back to its roots and hosting a Sean O’Casey retrospective series. For more information, click here. Click below to see Ciarán and Charlotte’s remarks upon being inducted into the Irish America Hall of Fame at an awards luncheon on March 14 at the Pierre Hotel in NYC. At first the names Arturo and O’Farrill don’t seem to belong together. But, in the long, romantic history of the Hibernia-Hispania connection, they do: Bernardo O’Higgins liberated Chile; the San Patricios Brigade fought for Mexico in its War of Independence; the Milesians, settlers of ancient Ireland, sailed from Spain to “the Promised Isle.” Then there were those lucky sailors, survivors of the Spanish Armada who, after being tossed on the shore of West Ireland, liked what they saw and just…stayed. Arturo likes to wear this African jacket when he performs. When the Catholic King James II was deposed, many Irish natives, realizing a grim future lay ahead, left Ireland, including a son of County Longford reborn in Cuba as Don Ricardo O’Farrill y O’Daly. Descendants of the Don prospered in Havana and today, their family mansion is the 4-star Hotel Palacio O’Farrill, featuring a Salón Longford. Havana was where Chico O’Farrill, father of today’s inductee, was born and rejected his father’s career choice (law) for himself, instead becoming a jazz musician and the star of the 1940s Afro-Cuban music scene. He brought his bold, fiery sound to New York, wrote with bebop greats to create a new style by fusing Latin rhythms with jazz. Chico never returned to Cuba. 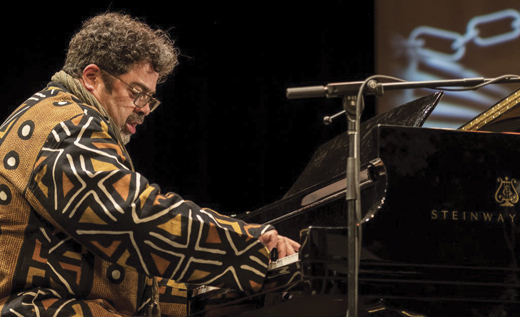 But his son, our Hall of Fame inductee, Arturo O’Farrill – pianist, composer, educator, and six-time Grammy winner – has returned for his father. 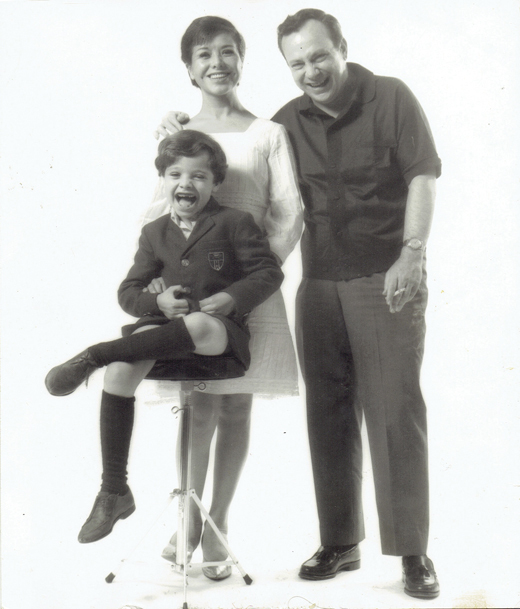 Lupe O’Farrill, Chico O’Farrill (Arturo’s parents), and little Arturito! Arturo has been America’s de facto cultural diplomat to Cuba, performing and teaching there since 2002. He has succeeded in building a bridge between the two countries despite decades of hostility between their governments. Arturo played the same role in Cuba that Louis Armstrong and Dizzy Gillespie played as “jazz ambassadors” to the Soviet Union, a mission that helped defuse tensions during the Cold War. 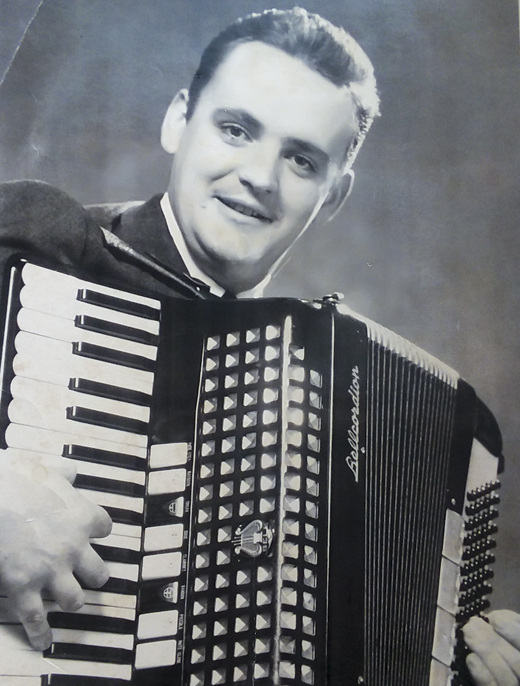 By performing with Cuba’s musicians and educating its youth, Arturo employed music’s greatest strength: the ability to communicate without saying a word. 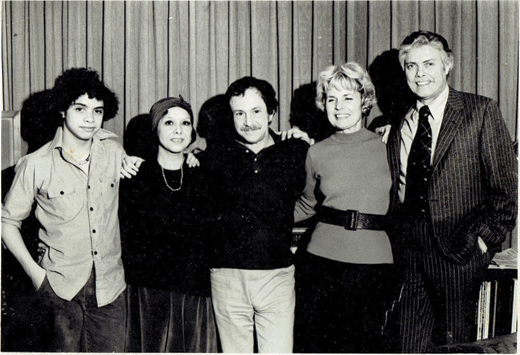 A younger Arturo with his parents, Lupe and Chico; family friend and music writer Graham; and a friend. In 2010 he was in the immigration area of José Martí Airport when he noticed something odd, “The guy who took my passport was smiling broadly, really beaming.” He soon found out why – President Obama had normalized relations with Cuba. Within 48 hours he was recording CUBA: The Conversation Continues, which later had critics raving, “A visionary album…by imagining the future, Arturo has given us something timeless.” Eight months later, he was at the newly re-opened U.S. Embassy when the American flag was raised for the first time in 54 years. 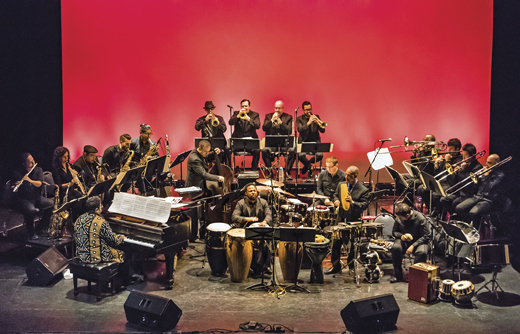 El Museo de Barrio; Afro Latin Jazz Alliance; Afro Latin JazzOrchestra; Arturo O’Farrill on piano. New York, 2017. But Arturo’s career didn’t begin in Afro-Cuban jazz; he first replayed Chico’s father / son conflict and rejected the music and culture of his own father. A piano virtuoso from an early age, Arturo vowed to avoid clavé, the five-beat pattern elemental to Cuban music. He wanted to forge his own musical identity working with groups that blended hip-hop, funk, and disco. At 19, experimental artist Carla Bley was in a bar, heard him play, and immediately recruited him for her band in an upcoming show at Carnegie Hall. After four years with Carla, Arturo went solo to tour the globe with, among others, Wynton Marsalis and Harry Belafonte. 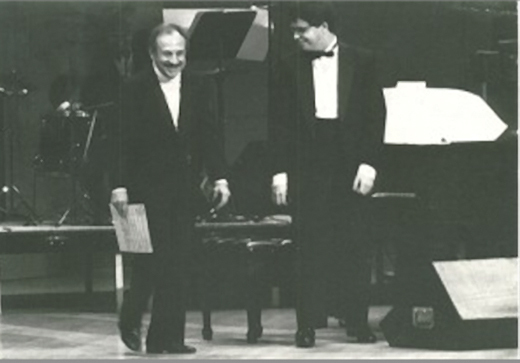 Performing with his father, the Cuban composer, at Carnegie Hall. 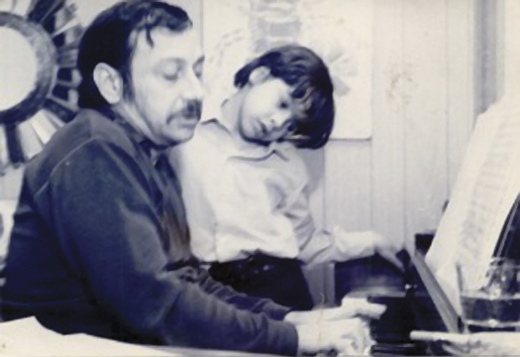 With his father, Chico, when Arturo was 6. The comeback gave the senior O’Farrill the greatest success of his career and a series of albums produced by Todd Barkan followed. The savvy producer found a fundamental difference between the O’Farrills, “Arturo is a very protean figure, more protean than even his dad because he has a wider scope of interests and influences.” To honor Chico, who died in 2001, Arturo assembled the Chico O’Farrill Afro-Cuban Band, later renamed the Afro Latin Jazz Orchestra (ALJO) a nonprofit arts and education organization that found a home at Lincoln Center and later at Symphony Space. Arturo with his sons, Adam and Zack, who are now grown up and are highly regarded musicians and composers. Seemingly tireless, Arturo continues to travel, performing both with his own band and other orchestras, producing albums, working with dance companies, and writing ballets. He’s received commissions from multiple institutions from Lincoln Center to the Apollo Theatre. He and his wife, Alison Dean, a classical pianist, have two sons, Zachary (a drummer) and Adam (a trumpeter), who formed their own musical group: the O’Farrill Brothers Band. The legacy continues. 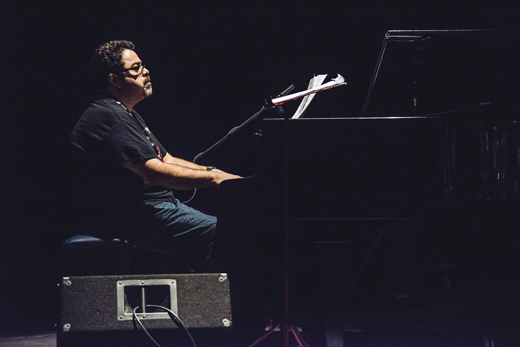 Performing in Cuba at the 30th Havana International Jazz Festival in 2015. The kid who rejected his musical heritage is now the global spokesperson for Afro-Cuban music. And speaking of heritage, Arturo co-founded and plays with Bill and Heather Bixler in a Celtic-Latin group, the Auction Project, creating “a place where Celtic reels merge with gospel and funk.” Their version of “She Moves Through the Fair” is unforgettable. Arturo is again returning to Ireland this summer, where he’ll tour and study traditional Irish music. It’s all more fodder for his television work-in-progress, Rhythms of Life, a series showing how the “universal language” offers windows into the lives of people around the world. Arturo’s recent and successful concert in Abu Dhabi, featuring artists from the Middle East, brought home the joyful message: music is what brings us together. Rosemary Rogers co-authored, with Sean Kelly, the best-selling humor / reference book Saints Preserve Us! Everything You Need to Know About Every Saint You’ll Ever Need (Random House, 1993), currently in its 18th international printing. The duo collaborated on four other books for Random House and calendars for Barnes & Noble. Rogers co-wrote two info / entertainment books for St. Martin’s Press. She is currently co-writing a book on empires for City Light Publishing. Watch the videos below of Arturo O’Farrill’s remarks upon being inducted into the Irish America Hall of Fame and his performance of “O Danny Boy” at the Pierre Hotel in NYC on March 14, 2019. It was the first time that I knew the full weight of Irish America. Coming from a small country with few people, it’s difficult for an immigrant to grasp that in a place as big as America, the Irish could wield such power. 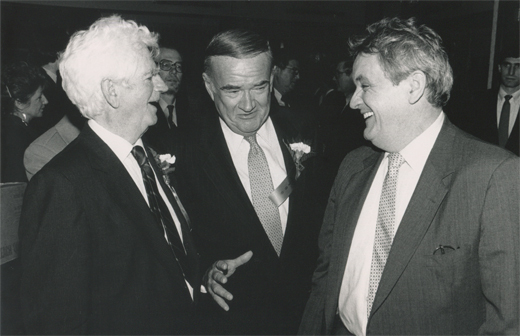 I’m talking about the first Irish-American Presidential Forum in 1992. It was arranged by then-assemblyman John C. Dearie. I don’t remember the venue, but I do remember the excitement in the room when candidate Bill Clinton, then the governor of Arkansas, showed up. Truth be told, having lived in California, I was a Jerry Brown fan. I might even have been wearing my “We the People” T-shirt. Brown was good on Ireland. He had a policy paper. But Brown was late, and by the time he got to the forum, Clinton had stolen the show. The genesis of what became the Good Friday Agreement was in the room that night. Over the following years, I watched it play out. I saw the power of Irish America being brought to bear on the Troubles and other issues important to the Irish. I saw the thrust of it in Adrian Flannelly’s work on immigration reform. I saw it, too, in the good will extended by Irish-American writers to Terry George, now an award-winning writer and director. And I saw, and continue to see, the love of heritage and the sharing of it, by Charlotte Moore and Ciarán O’Reilly, who for 30 years have been nourishing the soul of Irish America with their Irish Repertory Theatre productions, right here in New York City. Nowhere is the story of Irish America more arresting than in New York. It’s astonishing to look at the brass plates that adorn the wall in NYPD Commissioner O’Neill’s office – Irish name after Irish name – McGuire, Kelly, Murphy, McLaughlin, Ryan, and on and on: all of whom, at one time, held the job of commissioner, and oversaw what is the largest police department in the United States. O’Neill, as you will read in Maggie Holland’s cover story, is truly one of New York’s finest. He rose through the ranks from subway cop back in the 1980s, when New York’s transit system was one of the most dangerous in the country, to become New York’s top cop overseeing a neighborhood policing strategy that is bearing fruit, and as commissioner, he’s championing female empowerment and gender equality within the force. For all of our success in America, we Irish are travel birds who have settled in every corner of the globe, and wherever we go the music goes with us. Listen to Arturo O’Farrill’s “Oh Danny Boy,” or “She Moved Through the Fair.” These traditional Irish songs infused with Cuban, Mexican, and Afro flavors will touch your heart. Trinity College Dublin (TCD) celebrated the digitization of the Dublin Apocalypse manuscript, one of great medieval treasures of TCD’s library, on February 1. The 14th-century Latin manuscript of the Book of Revelation is accompanied by exquisite illustrations in gold and other vivid colors depicting scenes of the horsemen of the Apocalypse, battles with many-headed beasts, and the heavenly Jerusalem for its readers to enjoy. The manuscript has been in TCD’s possession for over a century, since former provost Franc Sadleir donated it from his private collection in 1851. Now for the first time, a full digital copy of the manuscript in all its splendor, 118 individual digital scans, can be viewed online by a global audience via the Library’s Digital Collections platform. Laura Cleaver, Professor in the History of Medieval Art, explains: “An illuminated manuscript of international importance by a master artist, the Dublin Apocalypse provides an arresting vision of the end of the world. Unusually, the images rather than the Latin text, dominate each page. In Nora Connolly’s 1935 memoir of her father, James Connolly, she mentions a play of his entitled The Agitator’s Wife, which scholars have never been able to find. A short story of the same name was recently discovered in an obscure journal in Warwick University’s library, leading University of Glasgow academics to believe it could be the long-lost work. The short story, which was found in an 1894 issue of the Labour Prophet, a Christian socialist journal, tells of the struggles of Scottish dockworkers against the Shipping Federation on the Leith waterfront. The workers’ leader, Tom Arnold, overwhelmed with despair from leading the strike in the face of police brutality with a sick child at home, is brought to contemplate suicide. His wife Mary comes to the rescue, leading the strikers when they were about to give up. The fact that it is a short story and not a play has not discouraged the scholars, who say that it could be a different version of the lost work or that Nora misinterpreted the genre when her mother spoke to her of the work. Ireland, the first to ban smoking in public places and the first to charge for plastic bags in supermarkets, is now taking it one step further. The Irish government has prohibited the purchase of all single-use plastics in its own offices as well as other public buildings, including schools. The products banned include a variety of commonly used items: cutlery, cups, plates, and cotton swabs among the worst offenders. The announcement came in January, following declarations by the European Parliament and the European Commission, establishing an objective to cut out the use of non-recyclable plastics across the E.U. over the coming years. Ireland was one of the first E.U. members to set forth a comprehensive plan in response.